So, you want to go dairy-free. Maybe someone told you that it might help with your skin issues. Maybe you have noticed that you get gas and bloating after you eat dairy and your bowel movements are looser. Maybe dairy doesn’t seem to agree with you as well as it did when you were younger. Maybe you have decided to go vegan. Maybe you are celiac and you are suffering from cross-reactivity. Maybe you have a casein allergy. Or maybe you watched a video on conventional dairy farming and you have decided to give up milk for good. Whatever the reason, many more people are deciding to go dairy-free. 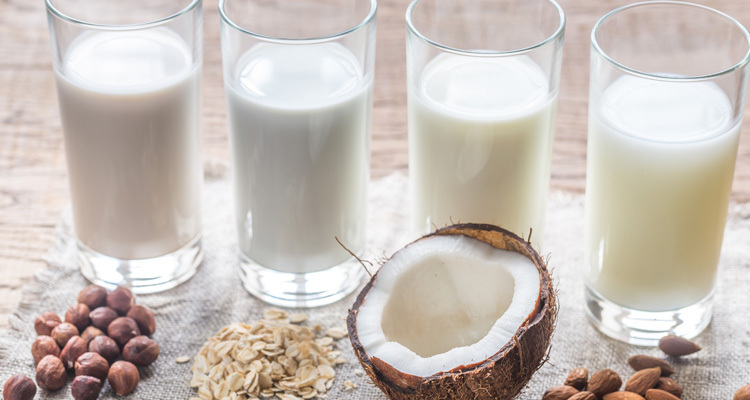 This is evidenced by the fact that the dairy-free trend is growing rapidly, as we have seen with the rising availability and selection of nut and seed milks and ice creams and dairy-free cheese alternatives in grocery stores. Most people know that dairy causes problems for people who suffer from lactose intolerance (in fact, 75% of the world’s population has a decreased ability to digest lactose after infancy) but it has also been associated with constipation, irritable bowel syndrome, skin problems like acne, and eczema, and chronic ear and sinus infections. Plus, many people are choosing to go dairy-free for ethical reasons as well. Unfortunately, most of us grew up believing that we need to consume dairy in order to get adequate amounts of calcium, which is a critical mineral for healthy bone growth and development. The truth however, is quite different. We can get plenty of calcium from green vegetables, beans, nuts and seeds (see below for a list of high-calcium foods), so don’t let a fear of inadequate calcium stop you from ditching the diary. Plus, you may be doing your body a favour by abstaining from dairy because it is high in saturated fat and sugar, has no fibre, and is acidic in the body. Now the idea of going dairy-free may seem daunting. My experience in working with hundreds of clients has taught me that no one ever wants to give up cheese! People dread giving up cheese even more than they dread giving up bread when they decide to go gluten-free. Second, it can be incredibly hard to give up because even if you have the best intentions, dairy is such a common food ingredient and additive that it is often hidden in unsuspecting places. The good news is that with just a bit of knowledge, it can be much easier to shop and eat dairy-free than you may think. Plus, to make it easier for your to transition to a dairy-free way of eating, I have created helpful lists to help you transition away from dairy, as well as a round-up of my favourite dairy-free recipes, which include substitutions for your old favourites like parmesan cheese, cream cheese, pesto, mac n’ cheese, ice cream, cheesecake and even chocolate mousse! See, as long as you are consuming the above-listed foods on a regular basis, you should have no problem achieving your recommended daily intake of 1000 mg of calcium per day. However, if you decide you absolutely, positively cannot live without dairy, then for ethical and health reasons, I at least recommend switching to organic diary from grass-fed cows. Cows are meant to eat grass and not grains, and by being allowed out to pasture, they can obtain natural vitamin D from the sun and omega 3’s from their food, they live longer and are healthier than conventionally-raised cows, which translates into healthier milk as well. Plus, because these cows are raised ethically, they are not given hormones to make them grow faster and they do not require antibiotics because they rarely get sick.